The Metropolitan Catholic Archbishop of Onitsha, Most Rev. 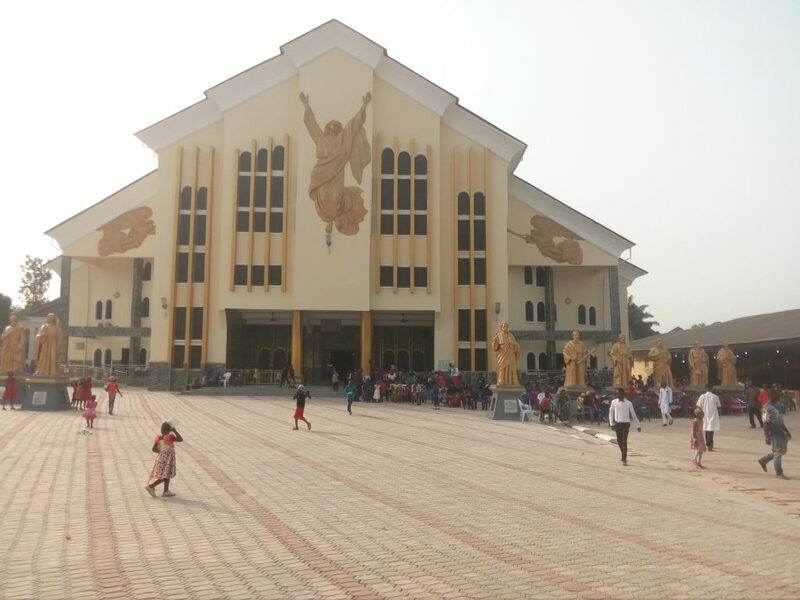 Valerian Okeke has dedicated the 10,000 seating capacity church built by charismatic Priest, Rev, Fr Emmanuel Obimma aka EbubeMounso at Umudioka, Anambra State. The dedication of the parish church of Blessed Iwene Tansi Parish, Umudioka Dunkofia council area of Anambra state attracted various personalities like the PDP Vice Presidential Candidate, Mr Peter Obi, Senators Victor Umeh, Uche Ekwunife, Stella Oduah , more than hundred priests including the Catholic Bishop of Minna Diocese, Martin Uzoukwu and Auxiliary Bishop of Onitsha Archdiocese, Dennis Isizor. In a homily during the dedication service, Archbishop Valerian Okeke noted that it is a great privilege to build for God recalling the story of David in the Bible who wanted to build a mighty temple for God but was rejected while his son , Solomon was chosen to instead. He said that Church dedication is a serious business reserved only for Bishops who represents Christ the owner of the Church. He disclosed that the Bishop can delegate other priests for numerous assignments like Confirmation, burials and other highly spiritual functions but cannot delegate anybody for church dedication. The Archbishop prayed that all who may step into the church to pray for any need may receive positive answers from God while the afflicted in any form may also find comfort in the church. Fr Emmanuel Obimma (Ebube Muonso) who is the Parish Priest, Blessed Iwene Tansi Parish in a remark lauded Archbishop Okeke for his fatherly role in the Archdiocese of Onitsha. Obimma who is also the Spiritual Director of the crowd pulling, Holy Ghost Adoration Ministries , Uke, Anambra State recalled the wonderful grace of God which saw him and the entire parishioners through to complete the church building in record time. He appreciated several support received from well meaning individuals towards the project and promised their fervent prayers for their benefactors. Mr Peter Obi, whom the cleric disclosed during the dedication as the one who provided the entire chairs inside the church and marble decorations, in a remark noted that to realize such a gigantic project under a recessed economy involved a lot of hard work and dedication. He said the greatest legacy of the impressive church building is in the common purpose and spirit of generosity among the faith community under Obimma’s guidance. Obimma as well said Senator Andy Uba representing Anambra South senatorial zone provided fund for the interlocking of the entire compound while Senator Victor Umeh provided finds for the vestments worn by Reverend fathers for the event.